President Silanyo (5th from right) and members of his cabinet at the presentation. More than one million citizens have signed a petition calling for the recognition of Somaliland by the international community, Somaliland President Ahmed Mohamed Silanyo told reporters in Hargeisa Tuesday. “It demonstrates the aspirations and the determination of Somaliland people to realize their principles that they believe and to protect their independence, which cannot be taken lightly, resisted or ignored,” Silanyo said. Somaliland seceded from Somalia in 1991 after a three-year civil war. The territory functions with relative autonomy, but no nation has recognized its independence. In response to the petition, Somalia reiterated its calls for unity. “Somaliland has an important value to us,” Somali parliament member Mohamed Omar Dalha told VOA. Somaliland officials say they have collected signatures from 1,021,000 people across Somaliland’s six regions since April. “The person would read a statement calling for the recognition of Somaliland. If they can’t read someone would read it to them,” Foreign Minister Sa’ad Ali Shire told VOA. “We then required them to give their names, telephone number, signature and name of district they live in. We checked their names against a local data base,” Shire said. 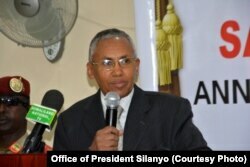 Somaliland Foreign Minister Sa'ad Ali Shire. Somaliland has its own currency, armed forces, and constitution, voted on by referendum in 2001. He said the petition will be sent to international bodies including the United Nations and the African Union. The Somali government has always insisted that Somaliland is part of Somalia. Dalha, of the Somali federal parliament, told VOA the Somali government has not done enough to engage Somaliland. “The policies by successive government towards our brothers have further driven them away rather than remedy the issues,” Dalha said. “They have concerns which are logical, understandable. How we tried to convince them has been lots of talk without action. We didn’t even try to reach out through cultural connections to cool their anger,” he said. In recent years, representatives from Somalia and Somaliland have met in Britain, the United Arab Emirates and Turkey, but all the agreements reached so far have been about issues like collaboration on airspace management. The major thorny issue - unity or secession - and the grievances driving the dispute have been avoided.